We visited Pittsburgh and went to see a baseball game with Tim's sister, who suggested walking across one of her favorite bridges in the city, the Smithfield Bridge, on our way to the ballpark. I can easily see the charm in this old bridge. It has a unique design and interesting history, plus I loved learning about the crossing's link to legendary bridge architect John A. Roebling. Multiple alterations to the current span over the years may lessen the bridge's historic character for some scholars, but the bridge still stands as a National Historic Landmark and embodies a huge piece of Pittsburgh history. The Smithfield Bridge is the oldest surviving river bridge in Pittsburgh, but it is actually the third bridge to span this particular Monongahela River crossing. In 1818, Louis Wernwag built the first bridge at this site. The wooden bridge, called the Monongahela Bridge, replaced a ferry and cost $102,000. A runaway river boat seriously damaged the bridge in 1832, and the Great Fire of 1845 destroyed it. A Roebling-designed wire rope suspension bridge was the second bridge at this crossing and opened as the Smithfield Bridge in 1847. 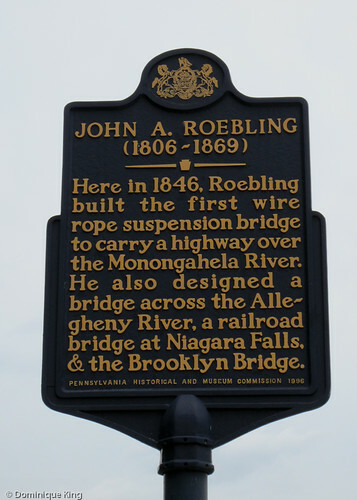 Roebling's design reused the abutments and six piers from the earlier bridge and featured eight 188-foot-long spans. By the late 1800s, increased traffic caused the bridge to sway to really sway under the loads, hastening its obsolescence. Self-taught bridge engineer and architect Gustav Lindenthal received the commission to design a replacement for the old wire rope suspension bridge. The Czech-born Lindenthal immigrated to the United States to improve his career prospects, coming to Philadelphia to work as a mason, draftsman and engineer on buildings for the 1876 Centennial Exposition. By 1881, he was working as an engineer in Pittsburgh. Lindenthal's design used unique lens-shaped, or lenticular, trusses that give it a unique look. 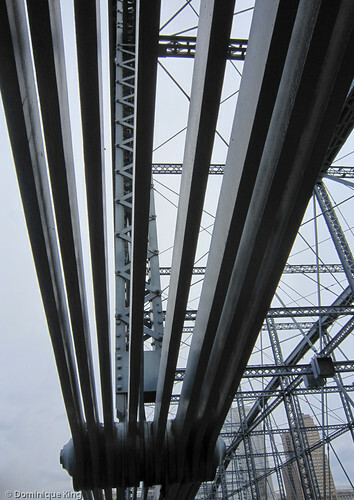 The lenticular trusses help distribute the tension and weight in a way that relieves a lot of the load on the supporting pylons. Builders can also fabricate the trusses on the ground and lift them into place atop the supporting structure. Lindenthal used the old stone piers from the previous bridges and further economized by using steel, rather than iron, for the bridge. The new Smithfield Bridge opened to traffic in 1883. Lindenthal designed his span with future expansion in mind, and increasing traffic soon made multiple renovations and alterations necessary. The original version only had one lane, but advent of electric streetcars led to widening the bridge's deck in 1889. Workers widened the bridge again in 1911. The bridge had rails for streetcars and carried double-tracked trolley busses until 1985. 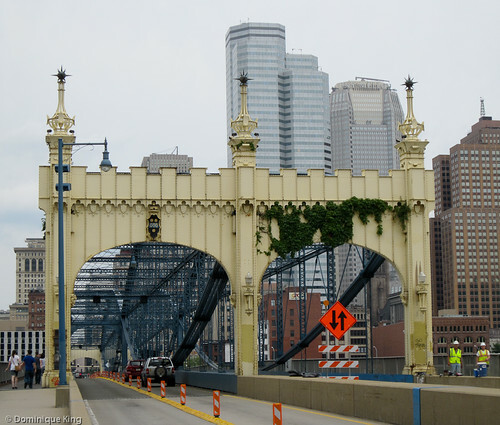 Pittsburgh's city architect Stanley L. Roush designed new portals for the bridge in 1915, replacing Lindenthal's more ornate wrought-iron portals at each end of the bridge. Roush's portals included ornaments featuring a miner holding a pick, a man holding a gear and the City of Pittsburgh coat of arms. Deterioration and a short clearance over the river led to a decision to demolish the Lindenthal bridge in the early 1990s. 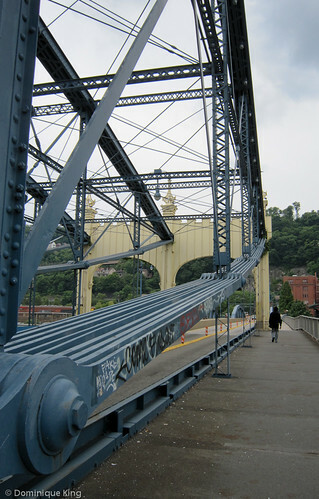 The Pittsburgh History and Landmarks Foundation lobbied successfully to save it, and the bridge underwent a major rehabilitation in 1994 and 1995. Workers removed the rail lines, resurfaced the road to create three vehicle lanes, reinforced the steel structure, and installed architectural lighting. The bridge's superstructure was an aluminum-grey color for most of its life until the 1990s rehab restored it to the original color scheme specified by Lindenthal of sandstone-yellow portals with royal-blue trusses. 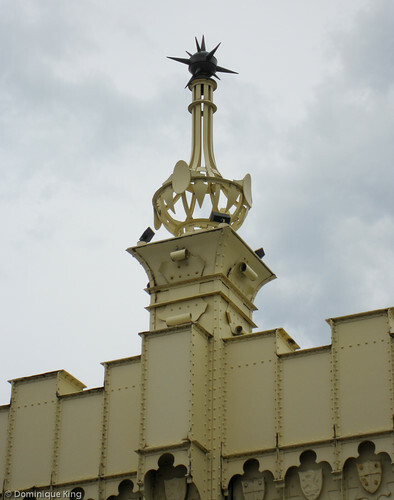 The rehab also restored the bridge's six copper finials previously removed because of deterioration to their original place on top of the portals. Today the bridge is one of the city's most heavily traveled pedestrian crossings. We saw plenty of foot and vehicle traffic, even as repairs took place during our visit. Read Catching a Pittsburgh Pirates baseball game to learn more about the ballpark and our trip to see a ball game there, the nearby Roberto Clemente (Sixth Street) Bridge in Pittsburgh, Pennsylvania, and Roebling Bridge links Ohio, Kentucky and Brooklyn to learn more about my favorite Roebling-designed bridge. 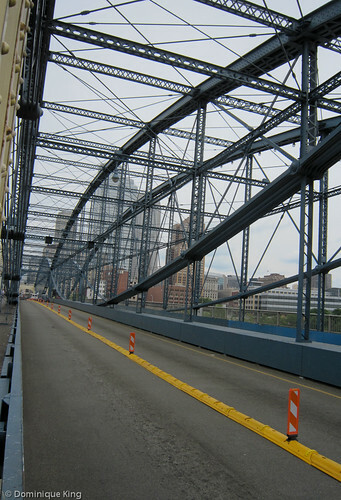 Want to learn more about Pittsburgh bridges? Check out Pittsburgh Bridges: Architecture and Engineering by Walter C. Kidney or Bridges of Pittsburgh by Bob Regan.